How does Saskatchewan PST apply to your business? In Saskatchewan, Provincial Sales Tax (PST) is charged at a rate of 6%. Every business that does business in Saskatchewan (whether resident in Saskatchewan or not) must charge PST on the sales of all tangible property, unless exempt. The Government of Saskatchewan defines "tangible property" as "Any property that can be seen, weighed or measured or that is in any way perceptible to the senses is considered to be tangible personal property." It also includes "data, information or material that is transferred transmitted or distributed by means such as landlines, wires, fibre optic cables, satellites etc." Many services are also required to charge and remit PST; the Saskatchewan government's Information for Service Enterprises provides a list of these services in Section I. Accounting and bookkeeping services, computer programs and services, lodging, real estate, and veterinary services are among those listed. In short then, the answer to the question, "When does my business charge PST in Saskatchewan?" is every time you make a sale unless you're selling something that is PST exempt or unless you're a small trader. Who Qualifies as a Small Trader for Saskatchewan PST? Small traders do not have to register for Saskatchewan PST and collect the tax. Notice, however, that production, sales or services all have to be conducted inside the person's home. As soon as you make sales or provide services outside your residence or sell to commercial customers you are required to become licensed and collect PST. What's PST Exempt in Saskatchewan? Registering for PST is easy; just fill out the Application for Vendor’s Licence/Consumer Registration form. The province will issue you either a vendor’s licence number or a registered consumer number, depending on the nature of your business. If you carry on business at more than one location in the province, you will receive a vendor’s licence for each place of business. This licence must be displayed in a location where it is visible to your customers. If you do not have business premises, you must carry your vendor’s licence with you while you are conducting business in Saskatchewan. Your licence must be available for inspection on request by your customers or a Revenue Division representative. 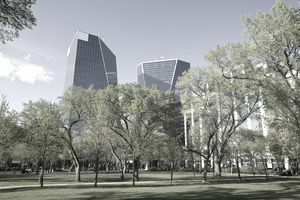 "Businesses located outside Saskatchewan that make retail sales in the province, or lease taxable goods in the province, including tangible personal property, taxable services, or contracts of insurance that are acquired for use or consumption in or relating to Saskatchewan, are required to become licensed to collect the PST. " This includes online sales. So, for instance, if you operate a small business selling stained glass ornaments and art objects that you've designed and sell them over the internet to customers in Saskatchewan, you are required to register for, charge, collect and remit Saskatchewan PST. What if You Ship Your Products Out of the Province? How Do You Record PST on an Invoice? In Saskatchewan, the Provincial Sales Tax owing is calculated based on the selling price of the article before GST has been applied. So let's suppose that the price you're charging for one particular stained glass ornament is $24.95. The GST is 5%, which is $1.25 and the PST is 6% in Saskatchewan, which is $1.50. You will list these charges separately on your sales invoice, along with the total of $27.70. Note that while this is also how Provincial Sales Tax is applied in Manitoba, Quebec and Prince Edward Island are the exceptions to this rule; in these two provinces, PST is charged based on the total of the selling price plus GST. What Do You Do With the PST You've Collected? You remit the PST you collect to the province. Just as you do with the GST, it's a matter of keeping track of the Provincial Sales Tax you collect and filling out and filing a PST return form. The form comes with line-by-line instructions. In Saskatchewan, how often you have to file your PST returns (and pay what you owe) is determined by the amount of PST you charge your customers each month; the government will tell you how often you have to file when you register. Note that also just like the GST, you must still file a "NIL" return if you have no tax to report in a particular assigned reporting period. You can file and pay your Saskatchewan PST return through SETS (the Saskatchewan Electronic Tax Service) if you wish. What About the Provincial Sales Tax You've Paid for Business Supplies? In Saskatchewan, you have to pay PST on any equipment or supplies that you purchase for use in your business. In fact, if you buy equipment or supplies from a supplier outside of Saskatchewan, you have to self-assess PST when you bring the goods into Saskatchewan. However, you can claim an exemption from PST for any taxable goods or taxable services that you purchase and intend to resell, such as your inventory. To do this you give your supplier your Provincial Sales Tax number.